All posters are the original one sheets approx 27x40 released by the studio. I will indicate in the title of the listing if it is double or single sided. All posters are rolled and have been stored in tubes since acquisition. They may or may not have minor edge wear (from sitting on their side), but nothing that would show if framed. If there is an issue (tear, crease, etc) I will indicate it in the pictures. 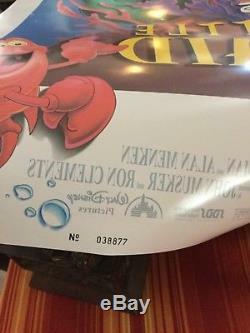 Otherwise all posters are in perfect condition. 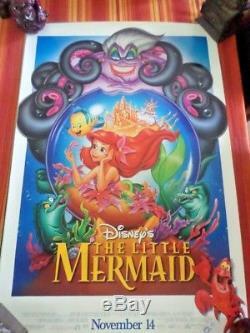 The item "THE LITTLE MERMAID MOVIE POSTER Double Sided ORIGINAL DISNEY NUMBERED" is in sale since Monday, May 14, 2018. This item is in the category "Entertainment Memorabilia\Movie Memorabilia\Posters\Originals-United States\1990-99". The seller is "lowinzahn" and is located in Peoria, Arizona. This item can be shipped to United States.